Situated in downtown Banding, Hebei Province, the Ancient Lotus Flower Pool was built during the Shangyuan Reign (674-676) of the Tang Dynasty, and was given its name due to the fact that lotus flowers grew luxuriantly in the pool. In 1733, or the 11th year of the Yongzheng Reign of the Qing Dynasty, the Lotus Flower Pool Academy was established northwest of the pool. Later, the place was converted into the emperor's temporary residence for his inspection tours. 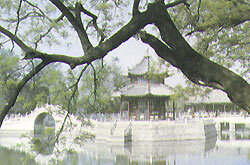 Emperors Qianlong and Jiaqing, and the Empress Dowager Cixi had all stopped there during their tours of Banding. Emperor Qianlong alone visited the pool six times. For this reason the garden around the pool grew steadily in size, until its space expanded to 24,000 square meters, and the pool itself occupies an area of 7,900 square meters. There are 12 scenic spots in the garden, including the Linqi Pavilion, Zhuojing Pavilion, Hanlu Chamber, and Zaoyong Hall. The Linqi Pavilion stands in the center of the pool, and scenic sights are arranged around the pool according to a picturesque design, so that buildings mingle with the garden to form a scene of captivating loveliness.